If you are using more then just one single MR-interface for your recording setup in a "stacked" combination, you´ll need to follow this special setup instruction to assure the no-latency monitoring abilities of the MR-interface. Of course it is possible to combine different types of MR interfaces, it makes no difference if you´re using a combination of two MR816 CSX and one MR816 X or just two MR816 X and one MR816 CSX. The following setup example consists of two MR816 CSX and one MR816 X to create a recording setup with 24 analogue inputs. First of all, please connect the Firewire ports of each single device. Please open the MR-editor. Corresponding to the connection set for all MR interfaces, each MR interface should be listed and displayed in the MR-editor. If not, please take a look whether the Yamaha Steinberg Firewire driver is installed and working properly. Please also make sure that the option "ADAT (1-6) + S/PDIF(coax)" is selected and set for each interface! Go to the S/PDIF output section. Here, please set the channel faders 1-8 and the master fader to "0" dB. You can just take a click on the fader-button while pressing the "ctrl"-key and the fader will automatically snap to "0" dB. Please save these settings as a "scene" by using the "file"-button in the end! Select the S/PDIF output section and set the channel faders 1-8 and the S/PDIF input channel to "0" dB. Please remember to save these settings, too! 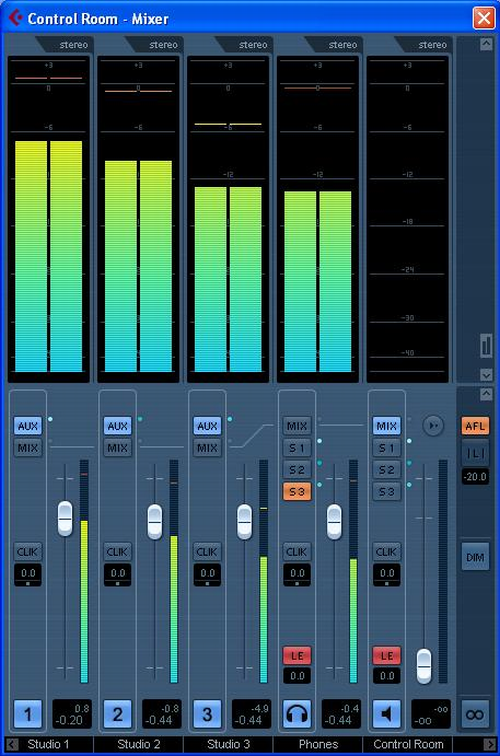 Now, please start Cubase/Nuendo and make sure that the "Yamaha Steinberg Firewire ASIO"-driver is selected as ASIO driver in your device setup. In this case, the port-assignment of Monitor send 3 matches with our real monitor mix output in the end! To guarantee a perfect signalflow through the devices, you´ll need to select the S/PDIF output of your "base" MR for Studio/Monitor 1 and the S/PDIF output of your second MR for Studio/Monitor 2. In this example we have selected some analogue outputs for the assignment of our headphone mix. If you want to use the MR headphone-amplifiers, just configure your headphone mix to these outputs with the audio hardware setup in Cubase/Nuendo. 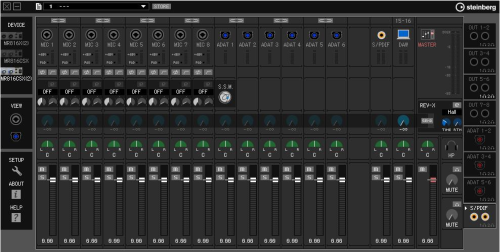 Now switch to your mixer in Cubase/Nuendo and create 24 mono inputs according to a 24 track analogue input recording. (This is just our example. If you want to add some digital ADAT inputs as well). Activate the monitor buttons in both channels and set the channel faders to "0" dB. Select the S/PDIF input of your "base" MR as input for your first channel and also activate the Monitor 2 in here. For the second channel, please select the S/PDIF input of the third "stacked" MR as channel input and activate the Studio/Monitor 3. The purpose of these additional channels is to integrate the signals of each interface into Cubase/Nuendo. You can see in this example that the signals from channel 8-16 supply Monitor 2. To add the signals from channels 1-8 to the sum, we need to use this first additional stereo channel. By activating the Studio/Monitor 2 in this "support" channel, we can achieve the signal transmission of the channels 1-8 to our monitoring sum. Please do not change the settings of these two channels, otherwise changes will have a negative effect on your signalflow. In this setup, every single send signal will be summed in Studio/Monitor 3, so its sum is adjustable via Studio/Monitor 3 in the control room. Please keep in mind to set the option "direct monitoring" in your device setup to enable no-latency monitoring. With this setting you´ll lose your level-meters in the control room. This is just an exemplary setup for 24 analogue inputs/playback without any sum output. Please remember that it´s also possible to use the additional ADAT I/Os.